To answer your questions—I have to agree with you that the passport/ID card was one of the most striking and moving parts of the entire [Holocaust] exhibit. Like you, the card I received was of someone very similar in age to myself, and that affected me greatly. More than I expected, really. I'm horrible about reading ahead, but I made myself not turn the pages until I was supposed to—I wanted to use the card as the thought-provoking experience it was intended to be. It's like trying to pick a snowflake out of an avalanche—how do you find just one thing in that museum that moved or affected you? All of it did, in different ways and forms. I think my only regret in how the museum was presented was that little was said about the economic conditions in post WW1 Germany. I think it might have helped place some of the later events in a greater context. While I don't think those events even come close to explaining what happened later, I think that historical context is a very good thing. With the passage of time we tend to compress the horror of the Holocaust into one day, one week, one year—we forget that events gradually built upon each other for years and years. We have the luxury of being able to step back and view the events of the 1930s and 1940s together, instead of living them day by day. It is harder to see the progression of change as you live it from day to day. It excuses nothing but puts a more proper perspective on things. My overall reaction is one of mixed sorrow and joy. The exhibits made me ask the same questions I ask myself on nearly a daily basis—what is it within this essence we call humanity that allows us to be so incredibly cruel to each other? What allows us to turn a blind eye to the suffering of others in comparison to our own comfort? How do we justify this? How can we look at any person and see them as less than ourselves? How can we proclaim someone superior or inferior though accidents of heredity? But on the other hand, other questions arise. What is it within ourselves that inspires us and gives us the courage to risk our lives to save others? While I am mystified at the cruelty that we inflict upon others, I'm equally mystified by the depths of courage, compassion, and conviction that we hear about now. Adversity brings out the truest nature of man—in times of greatest desperation we find out what stands in the hearts of our brothers and sisters. When faced with a need for action, it is the depths of people's hearts and faith—people you'd never expect such acts from—that cause the ordinary to become extraordinary. You see that over and over in the diaries and remembrances of the people we now call "resistance fighters." Most of them will say only, "I did what had to be done." I come away from the museum with many thoughts, much sorrow, but much faith as well. Humans are capable of many things, both of compassion and pain, but I have to believe that we have learned something. Just don't get me started on the concept of a Palestinian state. That's a whole other story. Now. New York. Don't blink, don't breathe, don't stop moving for a moment or it passes you by. Even from deli windows on the second floor you can look down and see the rush and crush of anonymous people. Always something to buy, something to sell, something to see and do. It is dirty. The sidewalks are anything but horizontal. Nobody smiles, and in a crowded subway train each person acts as though the train is theirs alone. It is not beautiful. It is a staggeringly large, mobile beast. The air is terrible, the people unconscious of your existence. But it is fascinating and beautiful in the way that any complex machine is beautiful—it is an incredibly complex combination of people and architecture and culture and business. I've never seen anything like it. I can recall few times in my life that I've been so fascinated—or felt so utterly alien. I'll go back, but be equally glad to come home. Broadway—Broadway is magnificent. There is something tangible in the building before a performance—not just the expectation of the audience but the satisfaction in knowing that you are watching something take place here, now. No enhancements, no retakes, just one shot at achieving rapport between performer and audience. Knowing that the people on stage are doing the one thing they've dreamed and wished and sweated and worked for—that for most of their lives they would have given up everything to be right where they are right now. Rent isn't perfect. There are some characters that could use further development, and the ensemble pieces were a bit overmiked. But the heart of the play holds together—people living together in the face of adversity (both from fate and of their own making). It is a rock-arena musical. In places it's hilarious (especially the answering machine messages). In places it's incredibly sad—especially the character of Angel. I knew the plot before attending the musical, and that helped. It helped to know that Angel, while a side character in the first half, is the focus of the second half. It is difficult to play someone as a "flaming drag queen" without overdramatization; I think the key to the play is making Angel flamboyant, far outside the norm, but vulnerable and human. It has to be characterization without caricature. I loved it. I wish I could see it again. If you get to hear the Broadway cast recording, then you'll hear a good portion of the people that I heard perform. There is nothing like New York here at home. I could never live there. I would never be happy. But what an incredible place to visit. 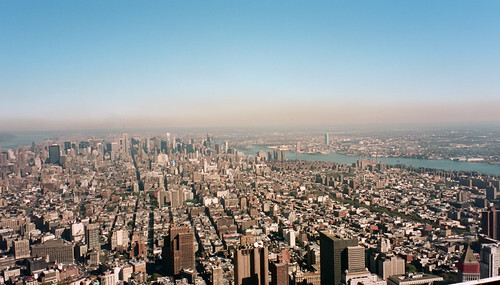 I really enjoyed looking at your NYC pictures from atop the World Trade Center. When were these taken? I was there winter of 2000. It's amazing how much the cityscape changed with the the two towers there.